Fifty years ago, a team of three undeterred University of Arizona astrophysicists huddled around a 36-inch telescope inside the dome of the UA’s observatory on top of Kitt Peak. With cobbled-together electronic equipment, W. John Cocke, Mike Disney and Don Taylor and made a historic discovery: the first detection of light flashes coming from a pulsar, a fast-spinning neutron star. On Jan. 15, a public lecture at the UA’s Steward Observatory recounted the discovery. In the audience was none other than Cocke, a member of the original team and now professor emeritus. Cocke spoke to UANews about those few days in January 1969 that spawned a new field in astrophysics: the science of pulsars, ultra-dense corpses of formerly massive stars whose bizarre nature is only surpassed by black holes. When your boss, Steward Observatory Director Bart Bok, learned about your observations and what you found, he was “horrified.” Why? Cocke: The first radio signals from what we now know are pulsars were detected by by Jocelyn Bell and Antony Hewish in the autumn of 1967. At that point, radio astronomers were really concerned how something as massive as a star could emit pulses that were only a second or a second and a half long. The first joke that came out was that these were radio signals from advanced civilizations, which became known as the LGM, the “Little Green Men” idea. Of course, nobody really believed that except people wearing tin foil helmets. In early November 1968, radio astronomers discovered this thing associated with the Crab Nebula that emitted about 30 pulses per second. At that point, everybody understood that they had to be neutron stars, and I had wondered about looking for optical counterparts of these things for a few months before. This pulsar, then, that was located rather near the Crab Nebula made me think of a very peculiar star in the middle of the Crab Nebula named for its discoverer, Swiss astronomer Walter Baade. He recognized that star was very peculiar and may be the collapsed remnant of the supernova explosion that had created the nebula itself. It is emitting a lot of light and even shows up on old photographic plates taken of the Crab Nebula. Mike Disney and I then teamed together, once we realized we were both theoreticians interested in gaining some experience doing observing. He suggested we cobble together some instrumentation that would allow us to do this. Cocke: We were looking into a pretty broad spectrum in the visible light spectrum, and we knew that any optical signal coming through the 36-inch telescope from Baade’s star would be pretty faint. We weren’t really sure what was needed, except that we needed something that allowed us to build up signals in a computer synced to the pulsar itself, so we could gather up enough signal with overlapping pulses coming in that we could build up a detection out of the noise. Interestingly, there was a report in the 1950s about an experienced pilot who looked at Baade’s star during a public telescope viewing and remarked that it appeared to flash, but her observation was dismissed. However, we did not know this at the time. We knew there were other groups of astronomers looking at pulsars with slower signal frequency, and they were not having success. We attached a photometer to the telescope and connected that to an off-the-shelf device called CAT – computer of average transients – which had a total memory of 400 bytes and could build up a signal above the noise so you could actually see something interesting. All of this instrumentation was put together properly by Don Taylor, and he became the third member of the team. Cocke: The first two nights were clear but wasted because I had made a mistake in calculating the Doppler shift due to Earth’s motion through space. A few cloudy nights followed, and we ran out of our allocated observing time. But it turned out that our colleague Bill Tifft was able to give us some of his observing nights because he had to take care of a family emergency. On January 15, within a few minutes of observing, we could see the pulse as it built up on the screen. We moved the telescope off Baade’s star to a nearby star or just a blank spot to see whether or not the signal would still come through like that, and it didn’t. Then we’d move it back on the pulsar but change the frequency setting so it was off, and we didn’t see that signal, so that was a good check. We then rechecked everything and did another round on the proper position and at the proper period, and the pulse would come up again. These were all checks we had to run to make sure this thing was real. On our screen, we saw a big main pulse and a smaller, secondary pulse – the exact pattern we expected from what the radio pulses look like. That was the final clincher. Terry Hunt is one of the world’s foremost experts on the Pacific Islands, which includes Rapa Nui, better known as Easter Island. New research PLoS One shows that Rapa Nui islanders built their iconic monuments close to freshwater sources. The ancient people of Rapa Nui, Chile, better known as Easter Island, built their famous ahu monuments near coastal freshwater sources, according to a team of researchers including faculty at the University of Arizona. The island of Rapa Nui is well-known for its elaborate ritual architecture, particularly its numerous statues, or moai, and ahu, the monumental platforms that supported them. Researchers have long wondered why ancient people built these monuments in their respective locations around the island, considering how much time and energy was required to construct them. 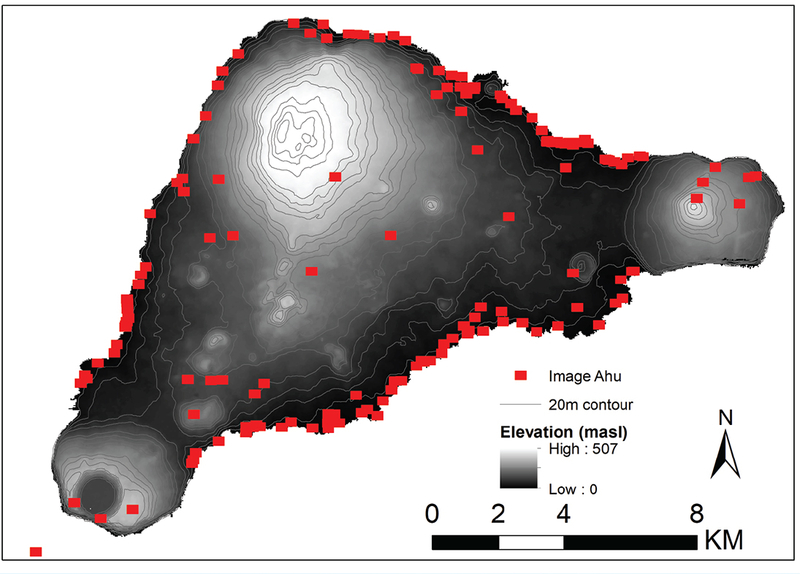 A team of researchers led by Robert DiNapoli of the University of Oregon used quantitative spatial modeling to explore the potential relations between ahu construction locations and subsistence resources, namely, rock mulch agricultural gardens, marine resources and freshwater sources – the three most critical resources on Rapa Nui. Their results suggest that ahu locations are explained by their proximity to the island’s limited freshwater sources. The proximity of the monuments to freshwater tells us a great deal about the ancient island society, said Terry Hunt, a professor of anthropology at the UA and Dean of the Honors College. “The monuments and statues are located in places with access to a resource critical to islanders on a daily basis – fresh water,” said Hunt, who has been researching the Pacific Islands for more than 30 years and has directed archaeological field research on Rapa Nui since 2001. “In this way, the monuments and statues of the islanders’ deified ancestors reflect generations of sharing, perhaps on a daily basis, centered on water, but also food, family and social ties, as well as cultural lore that reinforced knowledge of the island’s precarious sustainability. “The sharing points to a critical part of explaining the island’s paradox: despite limited resources, the islanders succeeded by sharing in activities, knowledge and resources for over 500 years until European contact disrupted life with foreign diseases, slave trading and other misfortunes of colonial interests,” Hunt added. Also contributing to this research were Matthew Becker and Tanya Brosnan of California State University, Long Beach, Sean Hixon of Pennsylvania State University, and Alex E. Morrison of the University of Auckland. In lieu of cataclysmic explosive events forging heavy isotopes, the team suggests they could be produced when an average-size star such as our sun becomes unstable toward the end of its life and undergoes a so-called helium flash, in which super-hot helium from the star’s core punches through the overlaying hydrogen envelope. “When Lucy and I started collaborating on this project, we realized that we could reconcile what we found in meteorites and what we observe in space,” said co-author Tom Zega, associate professor of cosmochemistry, planetary materials and astrobiology in the UA’s Lunar and Planetary Laboratory. The researchers are eagerly awaiting the discoveries that lie ahead for NASA’s OSIRIS-REx asteroid sample return mission, which is led by the UA. Just two weeks ago, the spacecraft arrived at its target asteroid, Bennu, from which it will collect a sample of pristine material in 2020. One of the mission’s major goals is to understand the evolution of Bennu and the origins of the solar system. “The study of explosive helium burning inside stars will start a new chapter in the story of the origin of the chemical elements,” said Neville “Nick” Woolf, Professor Emeritus at Steward Observatory and the fourth co-author. The UA-led OSIRIS-REx mission kicks into high gear while the spacecraft is on its final approach, closing in on asteroid Bennu and scheduled for arrival on Dec. 3. UA mission experts explain what comes next. Once OSIRIS-REx arrives at Bennu, why will it have to stay in orbit for two years before going for the sampling? What “eyes” does the spacecraft use to see and study the asteroid? A team led by UA doctoral student Teddy Kareta obtained a rare glimpse of the bizarre, blue asteroid that is responsible for Geminid Meteor Shower. In a unique study, University of Arizona astronomy students searched 101 clouds of gas to find those that may be in the first phases of forming massive stars. For three years, Jenny Calahan led fellow undergraduate students at the University of Arizona in research to help unravel the mystery of how the galaxy’s most massive stars are born. On July 23, just two months after Calahan graduated with a bachelor’s degree in physics and astronomy, the resulting research paper, Searching for Inflow Towards Massive Starless Clump Candidates Identified in the Bolocam Galactic Plane Survey, was published in The Astrophysical Journal. Her co-authors include students who assisted with the survey and research. Theories about how much gas and time it takes to make a star like our sun can be proven through observations, because each stage of a sun-like star’s life — from the collapse of gas clouds into a pre-stellar core to the star’s expansion into a red giant and collapse into a white dwarf — can be been seen throughout the galaxy. “There are a few theories for massive star formation that work in simulations, but we haven’t seen those initial conditions out in the wild universe,” Calahan said. One theory is the formation of massive cores, says Yancy Shirley, associate professor in the UA’s Department of Astronomy. The massive cores are dense collections of gas several times larger than the star they create. For massive stars, the cores must be at least 30 times the mass of our sun. “People are having trouble finding objects like that,” Shirley said. “This is the debate: which of these two pictures is more correct, or is it some combination of the two?” Shirley said. Calahan selected 101 subjects from a list of more than 2,000 huge, cold and seemingly starless clouds of gas called starless clump candidates, or SCCs. Using the Arizona Radio Observatory’s 12-meter radio telescope at the UA’s Steward Observatory on Kitt Peak, Calahan detected and tracked radio waves emitted by the molecular gas oxomethylium (HCO+), which emits a specific radio wavelength. Once Shirley and the undergraduate students he advises use the telescope to identify objects of special interest, like collapsing SCCs, the clumps of interest are then further studied using ALMA, which can peer deeper into the gas and find stars or other objects that cannot be seen with the 12-meter telescope. “One side is falling away from us and one side is falling towards us,” Calahan said. “The way we’re using it right now is as a pathfinder,” Shirley said. He and the undergraduate students he advises use the 12-meter telescope to conduct surveys that identify objects of special interest, like collapsing SCC’s. These clumps of interest are then further studied using ALMA, which can peer deeper into the gas and find stars or other objects that cannot be seen with the 12-meter telescope. Surveys take many dozens of hours to complete. Calahan and Shirley spent 19 weekends over the course of eight months to study the SCCs. Groups of undergraduate students traveled with Calahan and Shirley to telescope, where they learned astronomical observation and data analysis techniques. Shirley has served as adviser to several students who have published the research they did at UA, but Calahan is the first student of his whose paper was accepted before graduation. The findings, published in The Astrophysical Journal, may provide insights into the birth of our own solar system. What’s more, the Orion Nebula looks a lot like other planet-forming regions in the Milky Way, meaning our own solar system likely formed in an Orion-like environment. The team’s findings have been published in The Astrophysical Journal. “The general motivation for the whole field is that we want to understand more about how planets are formed,” says Josh Eisner, a UA professor of astronomy who led the study. In their pursuit of that understanding, scientists have spent decades looking to star-forming regions such as Taurus, a mere 500 light-years away (as compared to Orion’s 1,344). While its nearby location makes a slice of the universe such as Taurus easier to observe with less-powerful telescopes, it’s not what one might call a “typical” planet-forming region. Orion, on the other hand, with its many stars (and orbiting disks) clustered together in relatively small area, is typical. It requires a more powerful telescope to take sharp observations, but in terms of regions where planets — or entire solar systems — form, it’s a better model. Unlike those studied in nearby regions such as Taurus, planet-forming disks in the Orion Nebula don’t have enough stuff to build large planets such as Jupiter, for which you would need tens of Earth masses. According to Eisner, this may mean that much of the stuff already has been used to make young planets. Disks in Orion also appear smaller in size than those in Taurus-like regions. “It’s pretty tantalizing that Orion looks so different from all these lower-density, closer regions but it’s just one. We want to fill in the data with more of these high-density regions to see if they all look like Orion,” says Eisner, who is already seeking grant funding and telescope observing time to do so. “The initial conditions for planet formation can tell us a lot about the constraints and how the process really unfolds,” Eisner says. One theory about our solar system’s formation, called the Nice Model, argues that, early on, the configuration of the planets within a disk was small and compact until resonance finally flung Neptune and Uranus onto longer orbits. The fact that the small, compact systems Eisner’s team observed in the Orion’s disks match up so nicely with the initial planetary configuration in the Nice Model, Eisner says, is a compelling hint at the origins of our solar system. Our Milky Way’s largest neighbor, the Andromeda Galaxy, spans about 220,000 light-years across. Two of its dwarf satellite galaxies, Messier 110 (bottom left) and Messier 32 (above Andromeda’s central bulge), are visible as bright white spots in this image taken by UA astrophotographer Adam Block. A new technique for estimating the mass of galaxies promises more reliable results, especially when applied to large datasets generated by current and future surveys, according to a research team led by Ekta Patel at the University of Arizona. Published in The Astrophysical Journal, the study is the first to combine the observed full three-dimensional motions of several of the Milky Way’s satellite galaxies with extensive computer simulations to obtain a high-accuracy estimate for the mass of our home galaxy. Determining the mass of galaxies plays a crucial part in unraveling fundamental mysteries about the architecture of the universe. According to current cosmological models, a galaxy’s visible matter, such as stars, gas and dust, accounts for a mere 15 percent of its mass. The remaining 85 percent is believed to reside in dark matter, a mysterious component that never has been observed and whose physical properties remain largely unknown. The vast majority of a galaxy’s mass (mostly dark matter) is located in its halo, a vast, surrounding region containing few, if any, stars and whose shape is largely unknown. In a widely accepted cosmological model, dark-matter filaments span the entire universe, drawing luminous (“regular”) matter with them. Where they intersect, gas and dust accumulate and coalesce into galaxies. Over billions of years, small galaxies merge to form into larger ones, and as those grow in size and their gravitational pull reaches farther and farther into space, they attract a zoo of other small galaxies, which then become satellite galaxies. Their orbits are determined by their host galaxy, much like the sun’s gravitational pull directs the movement of planets and bodies in the solar system. Because it’s impossible to “weigh” a galaxy simply by looking at it — much less when the observer happens to be inside of it, as is the case with our Milky Way — researchers deduce a galaxy’s mass by studying the motions of celestial objects as they dance around the host galaxy, led by its gravitational pull. Such objects — also called tracers, because they trace the mass of their host galaxy — can be satellite galaxies or streams of stars created from the scattering of former galaxies that came too close to remain intact. Unlike previous methods commonly used to estimate a galaxy’s mass, such as measuring its tracers’ velocities and positions, the approach developed by Patel and her co-authors uses their angular momentum, which yields more reliable results because it doesn’t change over time. The angular momentum of a body in space depends on both its distance and speed. Since satellite galaxies tend to move around the Milky Way in elliptical orbits, their speeds increase as they get closer to our galaxy and decrease as they get farther away. Because the angular momentum is the product of both position and speed, there is no net change regardless of whether the tracer is at its closest or farthest position in its orbit. The study, which Patel presents on Thursday, June 7, at the 232nd meeting of the of the American Astronomical Society in Denver, is the first to look at the full three-dimensional motions of nine of the Milky Way’s 50 known satellite galaxies at once and compare their angular momentum measurements to a simulated universe containing a total of 20,000 host galaxies that resemble our own galaxy. Together those simulated galaxies host about 90,000 satellite galaxies. Patel’s team pinned down the Milky Way’s mass at 0.96 trillion solar masses. Previous estimates had placed our galaxy’s mass between 700 billion and 2 trillion solar masses. The results also reinforce estimates suggesting that the Andromeda Galaxy (M31) is more massive than our Milky Way. Additional co-authors on the paper, “Estimating the Mass of the Milky Way Using the Ensemble of Classical Satellite Galaxies,” are Kaisey Mandel at the Institute of Astronomy and the University of Cambridge, U.K., and Sangmo Tony Sohn with the Space Telescope Science Institute in Baltimore. Chi-Kwan Chan waves his hand a few inches above a matchbox-size device. On a dark computer monitor, a million light dots appear as a solid sheet, each dot representing a light particle. The photon sheet hovers above a black disc simulating a black hole. With a slow turn of the hand, the sheet approaches the black hole. As it passes, the gravitational monster swallows any light particles in its direct path, creating a circular cutout in the sheet of particles. The rest of the particles are on track to move past the black hole, or so it seems. But they don’t get very far: Instead of continuing along their straight lines of travel, their paths bend inward and they loop around the black hole and converge in one point, forming a sphere of photons around it. “What you see here is light trapped in the fabric of space and time, curving around the black hole by its massive gravity,” explains Chan, an assistant astronomer at the University of Arizona’s Steward Observatory, who developed the computer simulation as part of his research into how black holes interact with things that happen to be nearby. The demonstration was part of an event at UA’s Flandrau Science Center & Planetarium on Feb. 16 to kick off a UA-led, international project to develop new technologies that enable scientists to transfer, use and interpret massive datasets. Known as Partnerships for International Research and Education program, or PIRE, the effort is funded with $6 million over five years by the National Science Foundation, with an additional $3 million provided by partnering institutions around the world. While the award’s primary goal is to spawn technology that will help scientists take the first-ever picture of the supermassive black hole at the center of our Milky Way, the project’s scope is much bigger. What looks like a fun little animation on Chan’s computer screen is in fact a remarkable feat of computing and programming: As the computational astrophysicist drags virtual photons around a virtual black hole, a powerful graphics processor solves complex equations that dictate how each individual light particle would behave under the influence of the nearby black hole — simultaneously and in real time. Unlike the crew in the movie “Interstellar,” astrophysicists can’t travel to a black hole and study it from close range. Instead, they have to rely on simulations that mimic black holes based on their physical properties that are known to — or thought to — govern these most extreme objects in the universe. Chan belongs to a group of researchers in an international collaboration called the Event Horizon Telescope, or EHT, that is gearing up to capture the first picture of a black hole — not just any black hole, but the supermassive black hole in the center of our galaxy. Called Sagittarius A* (referred to as “Sgr A Star,” pronounced Sag A Star), this object has the mass of more than 4 million suns. Since nothing, not even light, can escape a black hole, it casts a silhouette in the background of in-falling plasma that is too small to be resolved by any single telescope. So far, the existence of Sgr A* has been inferred from indirect observations only, such as the intriguing choreography of stars in its vicinity, whose orbits clearly outline an unseen, incomprehensibly large mass. The EHT is an array of radio telescopes on five continents that together act as a virtual telescope the size of the Earth — the aperture needed to image “the date on the dime,” or in this case the supermassive black hole Sag A*. To accomplish this, the individual telescopes must be precisely synced in time. Because existing internet cables and even satellite communication are too coarse to ensure this, the researchers rely on atomic clocks and … FedEx (more on that later). At peak activity, the EHT will collect more data than any project before, according to Psaltis, a professor of astronomy and physics at the UA. The team uses graphic processing units, or GPUs — processors developed for gaming that are capable of performing many calculations in parallel. This makes them more efficient and energy-saving than “regular” computer processing units, or CPUs. “We hope that this technology will transfer to other areas of science and life,” said Joaquin Ruiz, dean of the UA College of Science, at the launch event. The PIRE project is expected to spin off technologies that go beyond the project’s primary goal. The fast processing of large data in real time and the efficient use of resources distributed across the globe will have applications ranging from self-driving cars to renewable energy production and national defense. Examples also include augmented reality applications that are good at fast computing with real-time input and minimum computing resources, Özel explains. The PIRE project team integrates researchers in the U.S., Germany, Mexico and Taiwan. Education of students and early career scientists is a key component, providing internally collaborative, hands-on experience in instrument technology, high-performance computing, and big and distributed data science. There also are monthly webinars and hackathons, as well as summer schools, that will be sponsored every year. Fast and reliable real-time communication channels are crucial in syncing up telescopes scattered around the globe for observations, and improving such technology is one of PIRE’s goals. For now, EHT scientists rely on video chat, phones and whiteboards to keep track of each telescope location’s status. During a rare stretch of a few days in April 2017, skies were mostly clear in all nine observing sites that are part of the EHT array — including Arizona, Hawaii, Chile, Mexico and Antarctica. The South Pole Telescope, or SPT, site was incorporated under another NSF grant to the UA, with Dan Marrone as principal investigator. Last year was the first year that the full EHT observed as an array, and the first year in which the SPT participated. During that first observation run, the observing stations that together make up the EHT pointed at the Milky Way’s center and collected radio waves originating from the supermassive black hole over the course of several nights. By obtaining the first-ever images of black holes, researchers will be able to directly test Einstein’s theory of general relativity in extreme conditions. The EHT data are shipped on physical carriers because current internet data pipelines aren’t up to the scope this endeavor requires. Then data experts combine the literal truckloads of data, synchronize it according to their time stamps and process it to extract the signal from the black hole, which in the raw data is buried under a blanket of noise and error — the inevitable side effects of turning the Earth into one giant telescope.